My coronation as captain of the Dobbs Ferry High School play-off bound basketball team in the fall of 1969 was years in the making. My hard work and dedication, dating back almost a decade, included day-long one-on-one contests with Porky Katz on every Rosh Hashanah and Yom Kippur. Kept home from school out of what my parents claimed was “respect” for our neighbors going to temple – i.e., pretty much all of them (except the Chinese Kwoks and Kings) – I was granted leave to furtively make my way to the basketball court, provided that, to avoid detection I carried and didn’t once dribble the ball to the court. I never quite understood my parents’ “respect” rationale, and our family’s sacrilege was well-known. But I was just happy to skip school and play ball with Porky, who, while hardly a desirable opponent, was the only other High Holiday truant. It was on that hallowed, slanted court, wedged into our Beacon Hill garden apartment complex where my parents dreamed and occasionally talked about earning enough to make it into the middle class, that I honed my skills. And it was there that I sacrificed my front tooth to the pole that held the dead metal backboard, against which I could hurl my ball with any amount of force and still watch it bank gently into the usually net-less hoop. My dad coached me on how to use my elbows and other basketball fundamentals, using the skills he’d learned as a 16 year-old City College JV player – shortly before the team’s infamous 1951 point-shaving scandal. Making the Dobbs Ferry school team had its rewards. The first was the pair of white high-top canvas Chuck Connor Converse sneakers (the only popular brand that existed in the pre-Air Jordan world) that Coach Kohl presented to each player who survived the cut. For me, making the cut brought a sense of relief and elation matched only by passing the driver’s test shortly after my 16th birthday and feeling up Marilyn Muller behind the rifle range at the poor excuse for a ranch camp where I spent 6 summers. I was one of only several white kids on our basketball team, and my black teammates were just about the only African Americans in our school of more than 400 kids. Like his counterparts in the surrounding Westchester towns, Coach Kohl recruited our stars from St. Christopher’s and the Graham School, two residential schools primarily for kids from the City, a number of whom had been in trouble or otherwise couldn’t be handled in the City’s public schools. Our “free agents” included Mickey, who broke the Westchester county scoring record; Herby, a very black, soft-spoken but powerful guy who tried to hump me against a locker in the back of the locker room after practice; Charlie, an erratic, good-looking kid who could pour in points with dazzling shots on those occasions when his head was in the game – and who, by dating my sister, instantly turned my father from a civil rights advocate and one-time good communist into a more typical racist suburban white father. Our center, Ronnie, had played for James Monroe, a perennial powerhouse in the Bronx, before being shipped off to Westchester. My best friend on the team was James Jackson. Smart, suave, and low-key, with a good sense of humor, James stood at only 5’9” – about my pre-shrinkage height. Graceful and quick, James could score. As I understood his story – and, at this distance, I don’t know how I learned it or how much is true – James had been drafted to run numbers and probably drugs in Harlem at the age of 11. He was the one among the City kids on the team who seemed to fold most seamlessly into the otherwise vanilla Dobbs Ferry High community. I don’t remember now whether James was among those of my teammates who sat together in a row at a weekly school assembly and, following the lead of our black-gloved 1968 Mexico City U.S. Olympic track medalists, stood to give the black power salute during the Pledge of Allegiance – after which all hell broke loose. What I do know is that the shadow of James’ past trailed and stuck to him, including the heroin first shot into him as a kid. The highlight, written-up in our local paper, was the home game in my senior year, 1970, when I scored the winning basket on a last minute break away. It’s hard now to separate facts from my faded memories and the stories I’ve told over the years. But I clearly remember that my winning shot was a short jumper about eight feet from the basket; I passed up the open lay-up because, having spent all those Jewish holidays hurling bank shots against our dead metal Beacon Hill backboard, I forever had trouble making simple lay-ups on the sensitive glass backboards which, for most kids marked their entry to the big leagues. I made my once-in-a-life-time game winning buzzer-beater, and in doing so not only became a momentary village hero, but matched and may even have exceeded my season’s average (probably about four or six points a game). Writing this piece has for the first time prompted me to search my mind (not just my memory) to understand just why Coach Kohl anointed me Captain. And, more specifically, to see if I could discern any reason other than that I was a hustling, white point guard. Thus far, the search has yielded nothing. If my dad could speak, I’m sure he would confidently make the case that I was the obvious choice. But he can’t. My former coach and sports mentor now spends his sporadic time awake looking at magazine pictures and the old Marx brothers CDs we bring him. With a nurse always at his side, he’s uninterested in watching the sports teams about which, like everything else, he was once so passionate and vehemently opinionated. 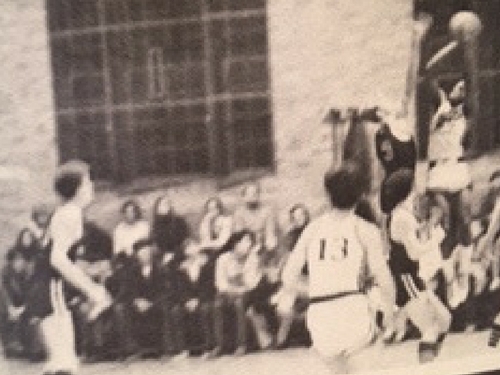 With me at the helm, after an undefeated 1969-70 season, we found ourselves in the county-playoffs before a huge crowd at the daunting and, to me, enormous, White Plains County Center. Our hopes of a championship were quickly doused, however, when a scrub on the opposing team slugged Ronnie, who naturally retaliated, ending in the predictable and, we’ve always claimed, intended result that both were ejected. They lost their scrub; we lost our star center and the game. With our season at an end, James and I graduated. I went off to Tufts University with dreams of finally losing my virginity. The next time I saw James, about a year later, he was dressed up in a suit and tie, lying in a box at my first open-casket funeral. I believe it was in Queens. A recent call to my sister confirmed that James and I had been Co-Captains. Nice piece Richard, I enjoyed it. Thanks for the memories. You are truly a gifted writer. This story had me thinking about to the “play areas” on BH and the names brought back memories. So many Friday nights spent at the gym watching the games. I gasped when I got to the end of the story. Like they say, I didn’t see that coming. I thoroughly enjoyed this article, as it brought back so many great memories. Like you I began my hoops life on the same slanted Beacon Hill basketball court, and also like you was not in temple on those days. I recall many games on this court with you. Now I’ll add a thought for you to recall. I’m sure you can remember the times when a much older (than us, maybe 30?) Crazy George Kosloff would drive onto the court in his old Porsche 356 (those are worth a lot today) and proclaim …. “This game is over!” as he would organize all into a new game that included him in the mix, and assign nicknames to all on the court. I was a “dribbling midget.” Unlike you I never made the school team despite what became a zealous love of the game. Thankfully I got a bit better after high school and continued to play ball for the rest of my life, and still pay full court today as the oldest guy in the game … unfortunately. Bummer to be the oldest one playing, but it’s better than not playing. I recall well some of those guys you reference and enjoyed a nice friendship with Mickey and James too, having had both to dinner at our home many times. I could share stories of joining James on his trips to the lower east side to pick up the contraband that ultimately led to his demise. Such a sad story there. You were very fortunate to be on such a truly wonderful basketball team that went undefeated, and we were also quite fortunate to get to enjoy watching this team. For such a tiny school that team was really talented. Mickey Oliver was a remarkable talent and should have gone on to play college ball at a high level. Many thanks for a thoroughly enjoyable ride down memory lane. Beautiful piece, Richard. I remember James, too, although I was too busy being a hippie to go to many basketball games. I also write about Dobbs in 1970; I’ve published a couple of paranormal YA romances set there, time travelers. They’re the first two books in a trilogy. And I’ve written tons of poetry about DF. Quick bio: I taught English for a lot of years, escaped, and now just plain write. Was James the one who yelled “Strike!” in the auditorium at the onset of the student (and some faculty) walk-out after Kent State, spring of ’70? I’m thinking it might have been him, but I can’t remember.